Every year, thousands of people visit the Salt River in the Tonto National Forest to enjoy scenic views of the Sonoran Desert along the riparian area. The natural ecosystem of the Salt River includes a canopy of mesquite, juniper, cottonwoods and palo verde trees, which serve as the habitats of birds such as the bald eagle. But for visitors who explore the area, they’ll likely also see piles of horse manure along the riverbank, in campsites and picnic areas. The horses that left the dung are not part of the natural ecosystem of the Salt River or even the American Southwest, but an invasive species, that, according to wildlife experts and scientists, is causing catastrophic harm to the Salt River’s natural ecosystem far beyond the unsightly feces. And those horses are now protected by Arizona law. While the horses cause widespread damage to the environment, they’re treasured by a small group of activists who believe the horses add to the allure of the area, pitting the two groups against one another. Over the past few years, the conflict has led to special action by federal agencies and a new state law that protects the horses. The Salt River horses, as they’ve come to be known, were first brought into the public eye in July 2015, after an announcement by the U.S. Forest Service that the agency would round up 100 horses and place them in a sanctuary. A group of activists calling themselves the Salt River Wild Horse Management Group and another called Friends of Animals immediately sued the Forest Service to block the removal of the horses. Salt River Wild Horse Management Group coordinated a campaign to get Arizonans to write letters and make calls to their public officials to stop the round-up. In addition to the phone calls and letters, Salt River Wild Horse Management Group also gathered 300,000 signatures on a petition to keep the horses in the Salt River area. The petition was delivered to U.S. Sen. Jeff Flake, who, along with U.S. Sen. John McCain, and a bipartisan coalition of Arizona’s congressional delegation, signed letters to the Forest Service and the Department of Agriculture urging them to leave the horses. Citing the public outcry, the Forest Service first delayed the roundup, then canceled it entirely. Carrie Templin, a spokeswoman for the Tonto National Forest, said some opposition was expected, but officials were still surprised by the volume and ferocity of the public reaction. To further protect the horses, Arizona state Rep. Kelly Townsend, R-Mesa, introduced HB 2340, also known as the Salt River Wild Horse Act, during the 2016 legislative session. Gov. Doug Ducey signed the bill into law later that year. The new law called for a partnership between the Arizona Department of Agriculture and the Forest Service to develop a plan on how to best manage the Salt River horses. It also made it illegal to harass the Salt River horses. 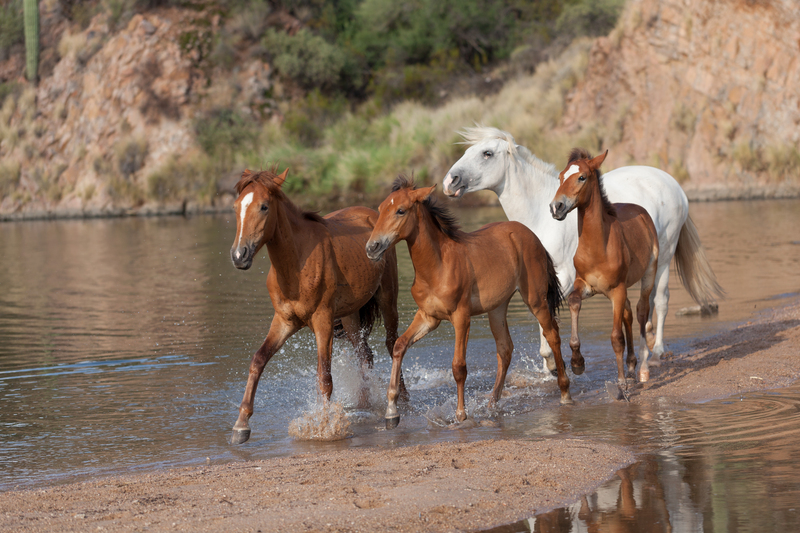 The law provides protection for the Salt River Horses that they did not have previously, when they were classified as “stray” animals. Though they are colloquially referred to as “wild horses,” they aren’t legally considered “wild,” which is defined as animals with no brands that show ownership, and which are a naturally occurring part of the habitat they occupy. 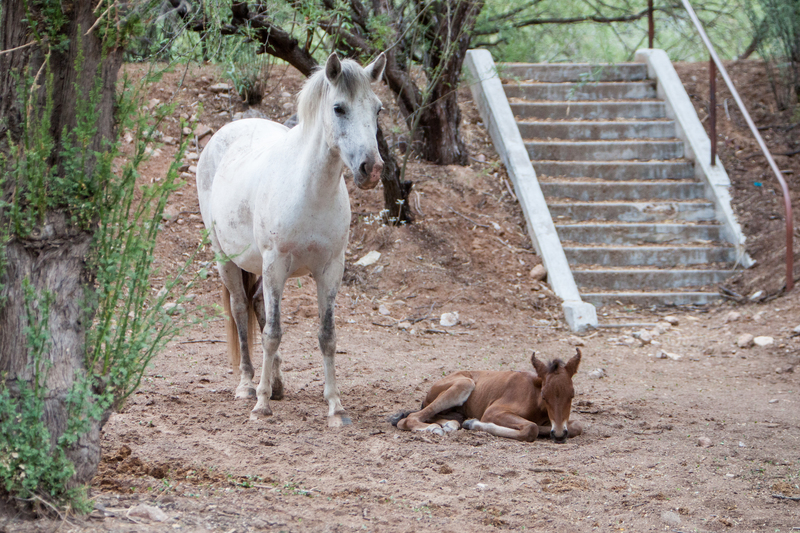 Chandler Mundy, a range staffer for the Tonto National Forest, said that, while the distinction may seem minor, the legal classification has a major effect on the outcome of the horses. The law says feral animals have an owner, but have been abandoned or escaped. If the Salt River horses had been classified as wild, they would have received federal protection under the Wild Horse and Burro act of 1971, Mundy said. Final approval of the partnership between the Forest Service and the Arizona Department of Agriculture came from Arizona Attorney General Mark Brnovich in late 2017. Now the two agencies are working with the U.S. Institute for Environmental Conflict Resolution to assemble an ad hoc working group that will help the agencies determine what the management plan will be. The working group will include representatives from as many as 20 advocacy groups, such as the Salt River Wild Horse Management Group and the Maricopa Audubon Society, a Department of Agriculture spokesperson said. While the Salt River horses are historic for the fact that this will be the first time a state government is managing animals on federal land, this is not the first time non-federal governments have moved to regulate wild horses. In 2008, the Salt River Pima-Maricopa Indian Community, which includes the area on the eastern side of the Salt River, directly across from the Tonto National Forest, commissioned an integrated natural resources study that, in part, addressed feral horses in the area. The findings were stark. Given how much area is required for a horse to survive, the study found that every inch of tribal land would need to be dedicated to supporting the horses already there. The Navajo Nation, in northern Arizona, is also facing an overpopulation problem with an estimated 40,000 stray horses roaming over 27,000 acres. 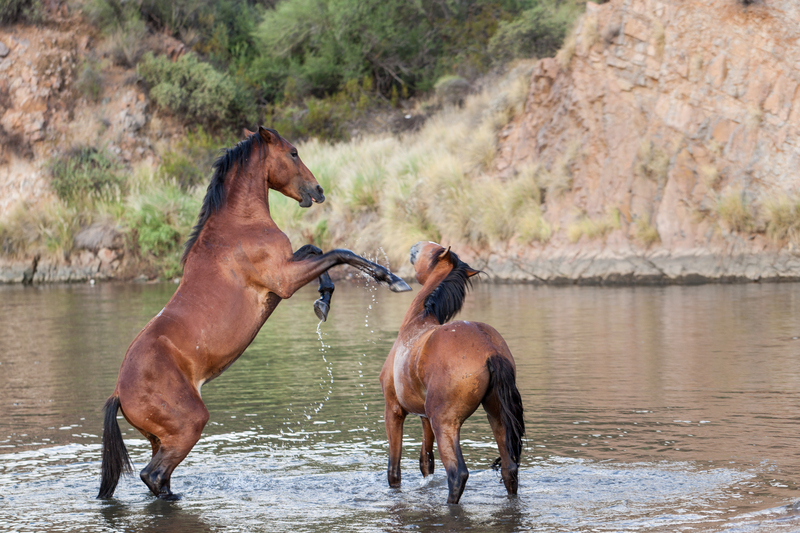 These horses, just like the Salt River horses, compete with other wildlife for vegetation and water. But Tonto National Forest’s 2015 round-up announcement came not because of environmental reasons, but rather because of concerns over public safety. While records provided by the Arizona Department of Public Safety and the Maricopa County Sheriff’s Office do not show incidents of Salt River Horses harming Tonto National Forest visitors, accident reports document five times vehicles have hit horses on the Beeline and Bush highways since 2015, the year the roundup was originally scheduled. Most of the accidents have resulted in major damage to the vehicles involved, with most having to be towed away from the scene. The outcomes for the horses involved are unknown, as they typically flee immediately after an accident. Members of Salt River Wild Horse Management Group voiced objections to the initial announcement of the round-up, claiming that the horses would be slaughtered after they were caught. There are no horse slaughterhouses in the United States, and it is illegal to slaughter horses. Mundy, of the Tonto National Forest, said the horses would have lived in a protected environment. It is common practice for rounded up stray horses to be sent to sanctuaries, typically in the midwest. Forest Service policy also prohibits the sale of rounded up horses to owners who plan to use them for commercial purposes. The Bureau of Land Management, which is also granted the authority to round up horses on public land by the Wild Horse and Burro Act of 1971, has a similar policy preventing captured horses from being given to owners who will use them for commercial purposes. Tom Taylor, a longtime volunteer with the Bureau of Land Management’s wild horse management program, said the agencies’ policies have led to a significant government expense to maintain rounded up horses kept in sanctuaries. This method of housing unadopted horses for the remainder of their life is unsustainable according to the BLM. In a report given to Congress on April 26, 2018, BLM reported that 60 percent of its $81 million yearly budget for the wild horse and burro management program is spent on housing the horses in sanctuaries. BLM also said that its goal is to keep horse and burro populations at an appropriate management level (AML). The agency has determined that 26,715 is the AML for the horse and burro population; at the end of 2017, the population of the two animals was 83,000. BLM estimates that the cost of sheltering 46,000 animals for the remainder of their lives would cost over one billion dollars. In response, the agency has proposed to Congress four different plans to deal with the wild horse and burro populations, including paying citizens $1,000 to adopt an animal. State agencies have also struggled with finding volunteers to adopt wild horses, echoing BLM’s report to Congress. The Nevada Department of Agriculture was unable to find someone to take ownership of 3,000 horses. Even when the state simply put out a call for candidates to take the horses, advocates for the animals cried that the horses would eventually make their way to slaughter. Horse advocates and the Forest Service also disagree about the number of horses actually in the Salt River area. In May 2017, the Forest Service surveyed the lower Salt River area and estimated there were 414 horses. Netherlands and her group believe there are only between 150 and 200 horses – essentially, they assert that the Forest Service counted each horse twice, and some horses three times, in its survey. The Arizona Department of Agriculture is basing its management plan on the Forest Service’s estimate of 414 horses in the Salt River area. Scientists and biologists also believe the horses damage the ecology of the Salt River area, but the National Forest Service has not performed a formal study on the environmental impact the horses have. ”That question has been asked many times – as far as what damage they do, and we haven’t answered the question, because we do not have any scientific data one way or the other,” Templin said. The National Forest Service has conducted a carrying capacity test, which evaluates how many of any given animal an area can support, but its results are not yet completed. The test is expected to determine how many structures, feeding troughs and fences will be needed to support the horse population. Although cattle had been allowed to graze in the Salt River area for decades, by the 1980s, the environmental impact of cattle was understood and the Tonto National Forest Service stopped granting grazing permits. In doing so, Tonto National Forest Service intended to allow the area to recuperate. This area, though, is now subject to grazing from the horses, which can be much more damaging. Mark Lawerson, president of the Maricopa Audubon Society, said the horses cause worse environmental damage than the cattle that are banned from grazing. “Cattle use their tongues to rip off grass and eat it. Horses use their teeth, down really low, practically to the root, and chomp it off or pull it out. So, horses are more environmentally damaging than cattle,” he said. Horses and cattle did not evolve in the Sonoran Desert, and the effects that such large animals can have on the landscape goes beyond the overgrazing of plants. For instance, the combination of a horse’s weight and its hooves ruins the biotic crust of the soil, leading to poor absorption of water, Lawerson said. The horses also loosen the dirt, which can then be kicked up by wind and carried into the river. The constant weight of horse hooves has turned areas that were once lush with cottonwoods and grass into brown, vacant expanses of loose dirt, Lawerson said. Entire bosques of mesquite trees look completely different than they did five years ago. Horses also roam for longer and further than cattle, so they damage a larger area. Lawerson said he’s seen the area change first-hand, and for the worse. “Just two or three years ago, I was in this exact spot,” Lawerson said, standing in the Butcher Jones recreation area, describing the grass, herbs, annual plants and weeds that naturally grew below the canopy of desert trees in the riparian areas surrounding the Salt River. Now, the area is barren and dusty. Horse hoof prints are visible in the loosened and trampled dirt. Lawerson pointed out the few scattered plants, some with signs of horse grazing. Those conditions, he explained, leave the area more prone to erosion, as the soil is easily kicked up by wind, people or animals. That topsoil also ends up in the river, creating excess sediment, where it damages fish habitats and clouds the water. That, in turn, obscures the fish for birds – including the golden eagles native to the region – that prey on them. The Salt River horses compete with the native birds in other ways, Lawerson said. The horses’ grazing on the natural vegetation means birds are left with less food, and less building materials for their nests. Netherlands, of the Salt River Wild Horse Management Group, said she disagrees with the scientists and National Forest Service evaluation of the horses’ negative environmental effects, because she thinks the nutrient-rich manure could have some positive effect on vegetation. Much is still up in the air concerning the Salt River Horses. The National Forest Service and Arizona Department of Agriculture are still assembling their working group of citizens to determine what needs the management plan needs to address. Meanwhile, as the wheels of bureaucracy turn, the Salt River Horses continue to damage the ecosystem around them.